We had our final lesson for this semester! We won't see each other until September. In today's lesson, we started with speed discussion and then we reviewed opinion giving structure. 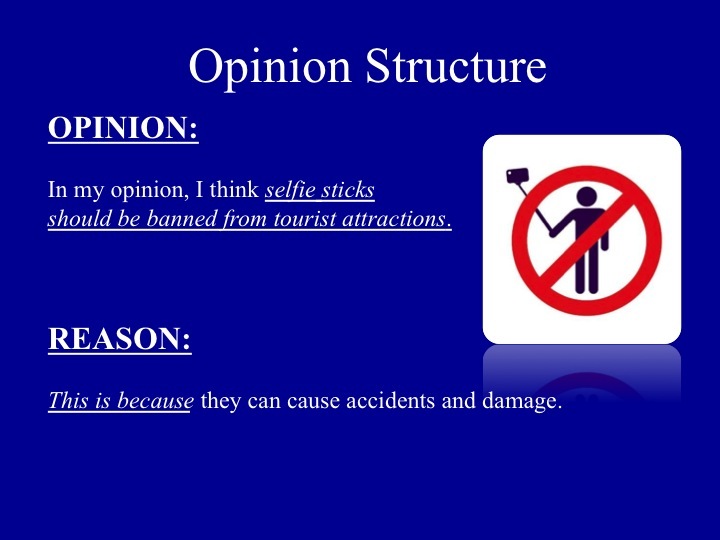 Please see the slides below for opinion structure. Next semester, we will continue building our opinion giving skills. After our opinion giving activity, I gave you your presentation evaluations and reviewed the grading criteria. Remember that all our course guidelines are in our syllabus in the Oral English 2 section. I'll have your grades calculated next week by July 22. If you would like to know your grade, please email me or send me a private message on Line. Have a fun (and safe) summer vacation! We're finished with presentations!! For our last two classes of the semester, we'll have some "fun" classes, so make sure to come. We finished with our second group of presentations in today's lesson. Overall, I was really happy to see a big improvement in eye contact and gestures this week. Also, presenters knew their information well, and didn't need to use their notes very often. Great work! I was happy to see that many presenters used expressions that they had learned from our discussions: "Let's move onto..." and "Are you following me?" By the end of our course, I will have your semester 1 grade calculated. If you would like to know your grade, please email me and I'll send it to you. For students who do not pass the course this semester, I will contact you and let you know the minimum score you'll have to get to pass both semesters. We're heading into the home stretch (the "home stretch" is the area between third base and home plate in baseball". This idiom means that you are almost finished something. In this case, we are almost finished out course. We finished our first group of presentations today. I was really impressed with your presentation skills, especially since you didn't do presentations in Oral English 1. For next week's presenters, it's really important that you speak loud enough. When you speak loud enough, it shows that you are confident about your topic. Groups 4, 5 and 6: arrive at 8:50am to prepare and set-up your poster. You can't read your notes. You can use them to help you remember. Before your presentation, please give me your corrected outline. Audience members: arrive on time! Can you believe we have only one more month of classes left? Time has gone by so quickly this semester. We finished our last round of discussions in today's lesson. Overall, there has been a big improvement in conversational style. Your discussions are almost 20 minutes now! When we first started in April, your discussions were only 10 minutes! Next semester, we'll continue with discussions skills. Groups 1, 2 and 3: arrive at 8:50am to prepare and set-up your poster. We had a busier lesson than usual, especially since we started our presentation preparation today. bullet train (noun) "I've never ridden the bullet train." smoker (noun) / non-smoker (noun) "I'm a non-smoker." second-hand smoke (noun) "Second-hand smoke can also cause cancer." proficiency tests (noun) "There are many types of English proficiency tests like Eiken, TOEFL and TOEIC." (do/practice) martial arts (verb) "Have you ever practiced a marial art?" tournament (noun) "There was a big sumo tournament on the weekend." Pronunication practice. Remember to have a pronounciation practice with your new vocabulary before you start your discussion. You need to know how to say a word if you want to remember it. Have your group say each new word 4-5 times. Before the end of our lesson, we through our presentation guidelines. 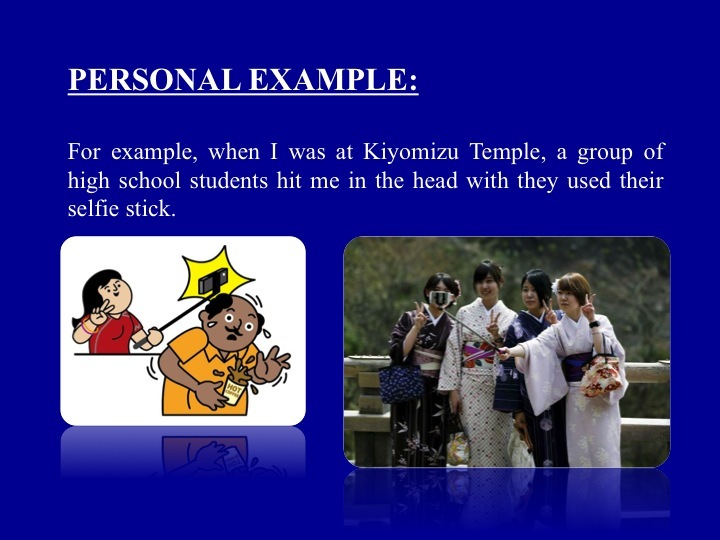 For your presentation, your group has to choose a Japanese social problem and give two solutions for it. In next week's class, we will learn how to make your presentations, such as presentation structure and expressions. Group leaders need to email me their presentation topic by Wednesday, June 3 by 6:00pm. Use formal email writing when you contact me. Please see the model in our Student Guide. What do you think about your hometown? Give your opinion with a reason and two examples to support your reason. Use opinion giving expressions and expressions to give examples. My hometown is Sault Ste. Marie. It's a small city in northern Ontario (Ontario is a province in Canada). In my opinion, my hometown is a great place to live because you can enjoy the outdoors all year around. For example, in the winter, you can go down-hill skiing or snowboarding on Searchmount, a mountain near my city. Also, in the summer, you can go hiking at Hiawatha Park, a big park in my city with many hiking trails, lakes and waterfalls. Submit by Wednesday, June 3 by 6:00pm. Suprise: Oh my God! Really? Wow! Sympathy: Oh no! What a shame. That's to bad. Follow-up Questions. Whenyour group leader or group member makes a comment. Ask a follow-up question. This question asks the speaker to give more information. Eye contact. Remember to make eye contact with each group member when you speak. We have finished our first round of discussions. You have received a lot of feedback in our lessons and on your worksheets. Which three points do you think you have to focus on to improve your next discussion? Submit by Wednesday, May 20 by 6:00pm. I hope everyone had a great Golden Week vacation, and you're well-rested for a busy May. b. Are there any questions? b. What was that again? Eye contact. Remember to make eye contact with each group member when you speak. Also, don't look up and don't look down. In some cultures, this means you are telling a lie. What suggestions do you have to stop bullying? In my opinion, I think we should ... (1st suggestion). In addition, we should ...2nd suggestion). Submit by Wednesday, May 13 by 6:00pm. Can you believe that it's already been one month since we first started our course? Time flies! Before our discussions, we reviewed Conversational Style. As you know, English conversational style is very different from the Japanese one. During a discussion, you can "jump in" at any time to ask a question or to make a comment. You don't have to wait to be invited to speak during a discussion. Explain your summary step-by-step. Do NOT read your summary. When you explain your summary, use these steps (a) explain 2-3 points; (b) pause; (c) check your group's understanding. During your summary and opinion, check your group's understanding. You can use these expressions: (a) Are you following me? (b) Are there any questions so far? Please remember that if you miss our lesson, you still have to complete the homework, especially if you are a discussion leader. If you have to change your discussion date due to illness, you need to contact me the day BEFORE (on Wednesday) and then give me a medical certificate in the next lesson. If you miss your discussion and do not contact me, you cannot re-schedule your discussion. What are your plans for the Golden Week vacation? Submit by Wednesday, May 6 by 6:00pm. In today's lesson we had our first group of discussions. Before we started our discussions, we went through the steps for leading a discussion. Please bring this worksheet to every class, especially if you are a discussion leader. When you have your discussion, you need to use English Conversational Style. English conversational style is very different from the Japanese one. During a discussion, you can "jump in" at any time to ask a question or to make a comment. You don't have to wait to be invited to speak during a discussion. Today, there were 7 students who did not come to class. If you are not a discussion leader, and you miss class without a good reason, you will lose points from your own discussion. Please attend class so that there are enough group members for discussions. Submit by Wednesday, April 29 by 6:00pm. It's almost Friday, so you can say TGIF tomorrow. Do you remember that expression from our lesson? We reviewed expressions to ask for and to give an opinion, and also expressions to agree and disagree with opinions. Please review these expressions because we will use them in every lesson. In next week's class, we are going to start our discussions. Each students has to be a discussion leader twice during the spring semester. You got a copy of the schedule in class, but there is also a copy in the OE2 Course Information section on the website. For the last part of our lesson, we learned where to find articles for discussion topics on the website Breaking News English. We also learned how to complete your discussion worksheet. You'll need to complete a worksheet before you lead your discussion. You can find How to Complete Your Discussion Worksheet in the Discussion section of the website. 3. Bring the "Opinion Expressions" worksheet to class. Choose one of the topics below. Give your opinion on the topic. Use an opinion giving expression, and give a reason and an example to support your opinion. * Submit by Wednesday, April 22 by 6:00pm. Someone from our class forgot their iPhone on the computer desk. It is silver and white. I brought the phone to the Teacher's staff room on the second floor. Please go there to get your phone. It was really great to meet all of you today. You're such a lively group!!! I'm really looking forward to our lessons this year. We had a short introduction activity and you got to meet your classmates. We then went looked at the syllabus and our course schedule. 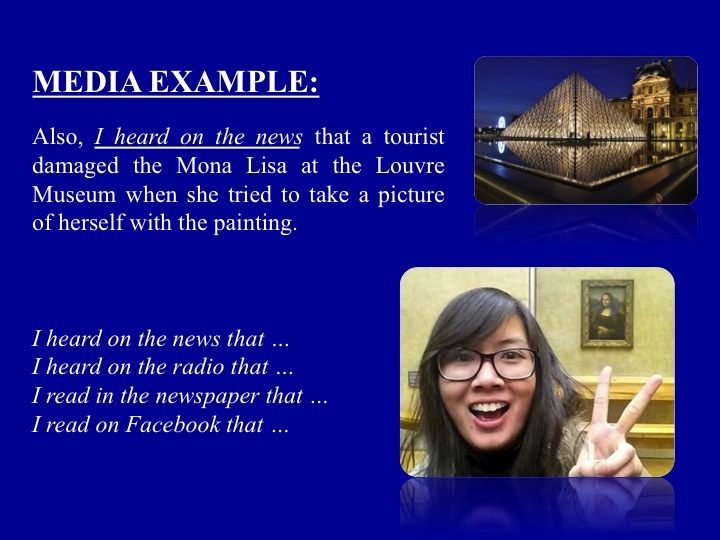 You can find all of this information in the Oral English 2 --> Course Information section. We had a short activity to help you learn some expressions for asking for and giving your opinion. Make sure to support your opinion with a reason and/or example. We also learnt expressions for agreeing and disagreeing. 1. What are your feelings on this? 2. What do you think about this? Kana: What do you think about Aogaku campus? Kohei: In my opinion, it's too crowded. Kana: Naoko, do you agree wtih Kohei's opinion? Naoko: Yes, I do. It's always crowded in the cafeteria. * Submit by Wednesday, April 15 by 6:00pm.